The above picture happens. Laughter ensues. And, I realize it’s best to be really literal. From then on I ask her to smile for the camera. But, I learned through the process that getting her to “pose” is one of the best ways to get her to pause long enough to avoid blurry photos. At least until I make the time to read up on ways to take advantage of faster camera shutter speeds! So, you get the wonderfully posed picture above since it’s one of the only ones that clearly shows off the front of my daughter’s new dress. As with most of my Mood Sewing Network projects, this one started with the fabric. I found this Bright Lavender/Dark Gray Slubbed Animal Printed Cotton Voile in Mood’s cotton section and thought my daughter would just love all of the animals and trees hidden in the print. We’re well on our way through the twos, and every day is a joy… and an adventure. My daughter is slowly discovering her independence, and with that has come an insistence on picking out her own clothes. Twirly dresses are a particular favorite, so I knew this lavender print was destined to become a twirly dress. I had McCall’s M4758 in mind since its full, tiered skirt looked like it had a lot of twirl potential. To add a bit of contrast, I found a Tinted Cream/Stone Polka Dotted Cotton Poplin also in Mood’s cotton section to use as the bodice of the dress. Construction was pretty much exactly the same as the last time I made this dress. 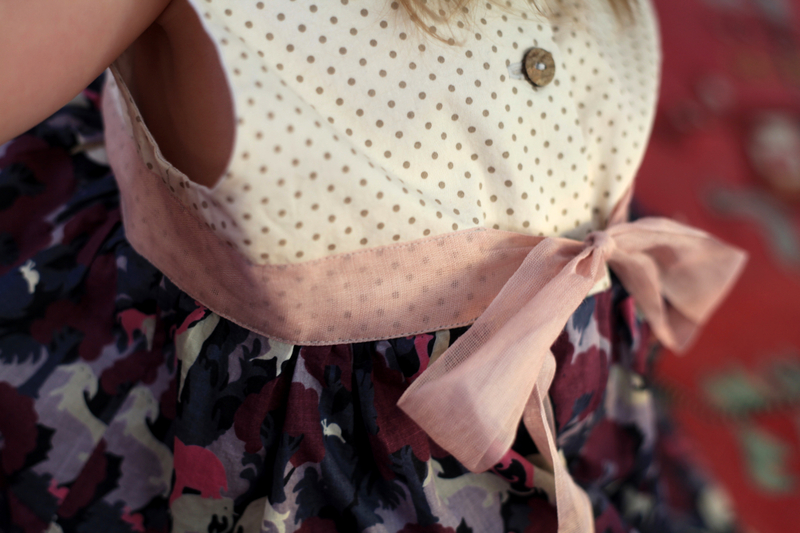 I finished off the look with coconut buttons and a pale lavender ribbon trim from my stash. I edge stitched the ribbon to the bodice, just barely overlapping the bottom of the ribbon with the waist seam, hiding the seam in the process. I ended the edge stitching a couple inches from center back so that the ribbon could be tied at the back. I really like how the polka dots show through the slightly transparent ribbon! I sewed the coconut buttons on backwards since I liked the raw color on the back of the buttons paired with the stone-colored polka dots. Finally, I lined the bodice with some white cotton voile from my stash. Just as the last time I made this dress, I left off the bottom tier of the dress. Last time it was because I didn’t have enough fabric. This time it was because my daughter requested a cape to go with her dress, and I wouldn’t have had enough fabric to do more than piece together a small cape if I’d added the bottom tier. Capes currently rank right up there with twirly dresses in my daughter’s opinion! We typically make capes for her by pinning our cloth napkins around her neck. I debated making a few cloth napkins from the lavender animal print and using them as multi-purpose capes. But, in the end I decided to make her a dedicated cape with a bonus tier that mimicked the tiers on her dress. The extra tier also adds a fun amount of volume to the bottom of the cape. I added buttonholes to the top corners and cinched everything together with a bit of the leftover ribbon trim. Both dress and cape were a hit with my little girl. I’m happy to have finally made her a couple things she can wear whenever she wants that don’t have a tail or feathers because they were meant for Halloween! The cute fabric was also a nice bonus that kept me motivated to find the time to sew a little bit every day!